Most people can identify with homesickness. You don’t need to be separated by oceans for the feeling to show its face, though being so certainly moves things along. This feeling is what the story is about predominantly, everything else plays second fiddle. 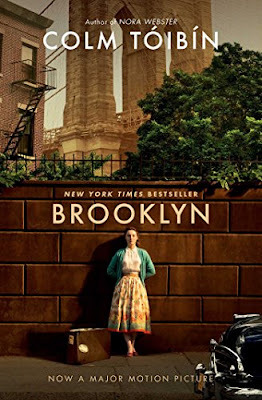 It’s interesting that the author chose to name it Brooklyn, since that just happens to be the place Eilis (the protagonist) moves to. It doesn’t really play a traditional titular role in the scheme of things, its biggest contribution being that it’s sufficiently away from home for Eilis. Speaking of Eilis, I love being able to see everything from her point of view. She is a refreshing mix of curious and wide-eyed. She’s a romantic in the sense that she finds elements of it in the everyday as well as the extraordinary. “Even going to work in a shop in Brooklyn with lodgings a few streets away, all organized by a priest, had an element of romance”, as did the ‘Christmas’ song sung by one of the men she’d helped feed in the church. She was lost in it, she realized he had not merely learned the song but he meant it and “Eilis knew how sorry this man was going to be, and how sorry she would be, when the song had ended”. I haven’t read any of Colm Toibin’s work prior to this, and that’s certainly going to change. The story is simple and somewhat spoiler-proof. Eilis moves to a new place and finds her feet, finds love, is pulled back home and faces a moment of truth. It advances at the gentle pace with which Eilis finds her feet, taking its time and letting us settle in as well. It’s a testament to how well it’s written that it keeps you hooked without any cliffhangers or intricate interwoven plot-lines. Every so often, some observation from Eilis made me sit back and take notice. The depth and simplicity of it all is very impressive, great writing skill at work. I’ll leave you with a couple of observations from Eilis, which ring true even if you’re not a young girl trying to find her way in life, miles away from home in postwar Brooklyn.